There is no question some drafts are bigger deals than others. Cowboys enthusiasts are understandably more excited when their team picks fourth in the draft (as happened in 2016) rather than 58th (as they will do in a few weeks). The only time in the last few decades the Cowboys have picked lower was in 2009. That happened to be the last time that they traded their first-round pick for a veteran wide receiver to save them during the season. If nothing else, 2009 serves as a reminder that things could be worse; 10 years ago, their first pick was the draft’s 69th. As we detailed in the piece linked above, that year’s draft featured the worst haul in franchise history. For the sake of all involved, the Cowboys cannot afford to let anything close to that happen again. They have just six picks in this draft, with two on Day 2 (#58 and #90) and four on Day 3 (#128, #136, #165, #241). They traded a few picks away to acquire Amari Cooper and Bene Benwikere and received one back as a compensatory selection at the end of Round 4 when Anthony Hitchens signed elsewhere. The price paid for Amari Cooper has already been well worth it, but those profits should continue to roll in. His contribution alone is a large reason why the Cowboys’ selections come near the end of rounds. Below, you will find the 23 times the Cowboys have made a selection between picks 51 and 60 over the years. This list features some memorable names, including three players still on the roster. This organization has found substantial value late in the second round with Mark Stepnoski, Harvey Martin, Todd Christensen and Danny White all taken in those spots between 1973-1989. Christensen only played one season in Dallas before being waived; he did not wish to play tight end. He ultimately came around on the idea in Oakland and enjoyed an excellent career, competing with Harvey Martin and Danny White for the greatest career on this list. When the Cowboys saw first-round-graded Sean Lee was still on the board in 2010, they traded pick #59 and a fourth-rounder to Philadelphia to move up four slots, believing the 3-4 teams between those two picks (Green Bay, Houston, and Baltimore) would grab Lee. Five Pro Bowls later, Lee has validated their decision despite injury issues that led him to fall in the draft. Gregory fell for other reasons. He was another first-round value with very problematic issues, having failed drug tests in the draft process out of Nebraska. The tail end of 2015’s second round offered two excellent pass rushers who both came with some level of concern. Gregory struggled with drugs, but Michigan’s Frank Clark was involved in a domestic violence incident in college. The Cowboys had just signed Greg Hardy the month before, so they were avoiding Clark. But they were happy to turn in Gregory’s name. He has played in 28 of a possible 64 professional games with seven career sacks and is slated to miss more time in 2019 due to another suspension. Clark has missed two games in his career, has 35 career sacks, and is under the franchise tag in Seattle. He is certainly eyeing the contract just signed by DeMarcus Lawrence (34 career sacks) for his new deal. Could you imagine Lawrence and Clark on the same defensive line? The Cowboys were so close to making that happen with consecutive second-round picks in 2014 and 2015. In other words, there is value to be found at No. 58. But sometimes it requires a little good fortune. Today, let’s look at five more edge rushers likely in the Cowboys’ range on Day 2. 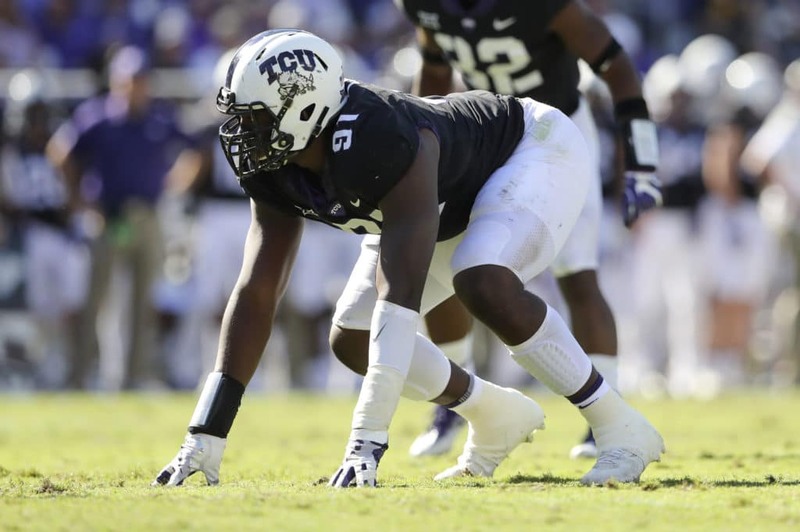 Collier is a late bloomer, as a redshirt senior who will be 24 years old early in his rookie season and was not considered a high-level prospect for most of his TCU career. But after a big 2018 and a very impressive Senior Bowl experience where he was the talk of some of the practice drills, Collier has climbed into the draft conversation. Positives: Collier is gifted with size, strength, and an uncommonly long wingspan, traits which help him win at the line of scrimmage. He sets quite an edge against the run and seldom allows plays to get outside his flank. His motor is one of his best characteristics, as is his ability to land the first significant pop of any snap with the man in front of him trying to recover. He has functional quickness inside, suggesting he can play DE or DT at the next level, flexibility the Cowboys covet. He also penetrates gaps with natural fluidity and takes fine pursuit down the line. Thick thighs which make him hard to move, as well as powerful hands, will cause issues at the next level. Collier #91 is able to walk his man right into his QB repeatedly with a bullrush that is probably his best edge move and utilizes his arm length. Concerns: There are quite a few. He did not produce for much of his college career and his testing scores in the 3-cone and the 20-yard shuttle (both used to measure defensive line athleticism) were both well-below average. He does not have elite athleticism, and his NFL role may not be on the edge. Further, his age suggests he is probably pretty close to his ceiling. Overall: Late bloomers happen all of the time, so we should not jump to too many conclusions about Collier’s upside. His 2018 tape was very impressive and I will always bet on current tape and motor to show me what a guy can do on Sundays. It is probably a little rich to go this far, but I think I am going to place him in SECOND-ROUND territory and see him as a legitimate Cowboys target. Here Collier demonstrates again versus Texas Tech that college tackles have very little answer for his strength. The name of the game for college prospects trying to get the NFL’s attention is sacks. So when a player hands over a resume that includes 67.5 tackles for loss and 45 sacks for 112 defensive explosives in 50 games, everyone takes careful notice. Ferguson did not play at the biggest school, but Louisiana Tech certainly faced plenty of elite competition over the years and he never seemed to slow down. Positives: Ferguson gets to the passer and to the ball on a regular basis. His arms are absurdly long, and he also uses his hands very well to clear a path to the ball. His best attributes are converting speed into power and overwhelming tackles, as well as demanding double teams. He gets all sorts of attention and yet remains productive, even if he is playing SEC opponents who usually have answers for non-conference minnows. He was simply too good at his level. Ferguson #45 comes off either edge in 2 or 3-point stances and puts the tackle off balance. If he sees you over-set the edge, he simply takes the inside path home. Concerns: Ferguson does not appear to be the most sudden athlete. His game tape and testing both indicate his fluidity and lateral speed changes will not be catch NFL linemen off-guard. Further, his motor appears suspect at times. That would be tough to overcome with limited athleticism. Ferguson is a very good player, but becoming an outstanding professional will take hard work. Overall: Sometimes we overemphasize combine results, but Ferguson’s 8.08-second 3-cone drill was not just bad. It was horrible. Defensive tackles run that drill better than Ferguson, and that is tough to shake. That said, this is the reason he may be available later than his production would dictate. Do you trust the tape and production or do you look a those testing scores and run the other way? I will put him in my SECOND-ROUND grouping. Nearly a sack a game over a four-year span suggests Ferguson is pretty good at doing what you want him to do. Here Ferguson is able to show that despite some real testing issues, he can turn those hips well enough in the pocket and get to the QB. Nelson’s profile has grown this spring because he has far more athleticism than first believed. He dominated the 3-cone and 20-yard shuttle while being one of the biggest defensive ends in this year’s crop. Add that to his All-Big 10 honors in 2018, his best season for the Hawkeyes, and he is firmly in the mix. Positives: Nelson sure looks the part, at 6’7 with the 83″ wingspan of a defensive end who is difficult to deal with against the pass and the run. He has really strong hands and lands a jolt at the snap with some nice burst for a man his size. He is a real handful and his get-off shows that he is up for each play. He plays hard and rallies to the play, and his ability to set an edge makes runs to his side difficult. Nelson holds the point of attack with ease. He is an intelligent player and reads plays well. There is plenty in his toolbox and I assume is also capable of moving inside to defensive tackle. Nelson #98 just destroyed this Nebraska RT all afternoon with a series of moves, but his bullrush and arm length was the best. Concerns: He certainly has some scheme limitations and should not be considered a 3-4 edge, but when you put his hand in the dirt, I don’t see much to worry about. His bench press suggest some strength questions, but I usually discount that worry with the fact that players with really long arms rarely bench press very well. On the field, I see power and I also see a guy who just turned 22, so we can project what an NFL weight room might do for him. He might be a solid pass-rusher as opposed to an outstanding one. Overall: I was really impressed with Nelson. I think he has a real chance to be a very nice player and I have no problem putting him in the group with the SECOND-ROUND edge players. I see some Tyrone Crawford-type attributes and I think most teams would be pretty pleased with that sort of value near the end of the second round. Nelson here employs the push-pull move to get around the corner and gets a key sack against Penn State. Omenihu is a very familiar name in this neck of the woods, as he was named All-Big 12 and the Defensive Lineman of the Year for a tough defensive unit often led by this senior, who not only played well but also had no issue taking a leadership role on and off the field. Positives: Omenihu is not an actual edge player and putting him in this group may be a bit unfair. He is more of an interior player or a 5-technique in an odd front. This means he is bigger, stronger, and asked to do fewer things as a pass rusher. He is very good against the run and also features absurd arm length and wingspan to keep blocks off him or extended to where he controls the confrontation. He really battles inside and his motor generally runs hot. I like his intelligence and his leadership skills, too. Omenihu occasionally does get around the corner in an edge rush situation as he did here against USC. That just isn’t something we see often. Concerns: Questions about Omenihu will primarily be based on what you will ask him to do and what scheme you put him in. As an edge, there is just nothing extraordinary about his pass-rushing ability. I don’t think that is what he will do well at the next level, as he doesn’t appear very sudden. He also doesn’t have well-developed moves or techniques, and therefore is not really about sacks or pressures, mostly gaining them from motor and effort. However, as another flexible player up front, you might have something. Overall: I would probably recommend he finds a 3-4 home as a 5-technique or is drafted by a 4-3 team willing to develop him a bit further. There is a lot to like and he does appear to have plenty of tools, but he will need to find the right situation. He is a THIRD-FOURTH-ROUND prospect. Part of Omenihu’s value is his vision to see what is happening around him like this screen versus Georgia. Watch Michigan play defense and you’ll have a hard time missing Winovich. He has long hair that changes colors frequently and is constantly on the move, evoking regular mentions of his motor. He has been pretty productive in his last two seasons and will turn 24 years old before the draft. Positives: Not every long-haired, high-motor guy is Clay Matthews, but there are certainly some similarities in their games when it comes to the pedal-to-the-metal approach of just out-working whoever is in front of you to get to the ball. Winovich is very good with his hands and can get all over the field against the run. He tested very well in the 3-cone and the 20-yard shuttle (both 90% or better) and is a blur on the field. He plays every snap like it means something personally to him, and he has made a lot of plays in big situations. He is relentless. Here against Penn State, you can see that it isn’t quite the prettiest technique ever, but he bounces off bodies on his way to the QB. Concerns: Unlike Clay Matthews, he does not win consistently as a pass rusher. I don’t believe he has a ton of upside. The big concern, then, becomes finding the right spot for him. He surely would have to be a rotational edge rusher as there is little to suggest he can be a 3-4 OLB. He is more of a under-sized 4-3 DE who has value, but probably just in nickel situations. How highly would you draft a 30-snap player? Overall: I like Winovich quite a bit, but there are degrees of how much you should value a player in a limited role. He is not an elite pass-rusher but he is also not big enough to fill other roles on the defensive line. In other words, I have no question that he helps somebody out, but perhaps you have to assume it will start with rotational usage and special teams. I like him, but probably just as a SECOND-THIRD-ROUND grade. Winovich probably isn’t a 3-4 outside LB, but does have the athleticism as a 4-3 pass rusher to get to the edge against the pitch out. The more I watch Collier, the less I want anything to do with him. It seems to me like they're trying to find a guy in the mold of Crawford, i.e. a bigger, less explosive DE who can play the run in base packages and rush on the interior in nickel/dime. That's the mold that guys like Collier, Ferguson, and Omenihu all fit. It makes sense in one way because Crawford is not long for this team given his age and contract, on the other it's pretty stupid because Crawford probably fits best as a 3-4 DE and we've been shuffling him around for years, so why bother looking for another guy like him?